"Gná" redirects here. For other uses, see GNA (disambiguation). In Norse mythology, Gná is a goddess who runs errands in other worlds for the goddess Frigg and rides the flying, sea-treading horse Hófvarpnir (Old Norse "he who throws his hoofs about", "hoof-thrower" or "hoof kicker"). Gná and Hófvarpnir are attested in the Prose Edda, written in the 13th century by Snorri Sturluson. Scholarly theories have been proposed about Gná as a "goddess of fullness" and as potentially cognate to Fama from Roman mythology. Hófvarpnir and the eight-legged steed Sleipnir have been cited examples of transcendent horses in Norse mythology. or moves through the air?" The source for these stanzas is not provided and they are otherwise unattested. High ends his description of Gná by saying that "from Gna's name comes the custom of saying that something gnaefir [looms] when it rises up high." In the Prose Edda book Skáldskaparmál, Gná is included among a list of 27 ásynjur names. 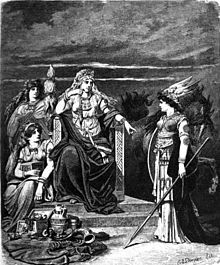 Frigg sends Gná, riding on Hófvarpnir, on an errand in Frigg and her Maidens (1902). Rudolf Simek says that the etymology that Snorri presents in Gylfaginning for the name Gná may not be correct, yet it is unclear what the name may otherwise mean, though Gná has also been etymologically theorized as a "goddess of fullness." John Lindow calls the verse exchange between the Vanir and Gná "strange" and points out that it's unclear why it should specifically be the Vanir that witness Gná flying through the air. Ulla Loumand cites Hófvarpnir and the eight-legged horse Sleipnir as "prime examples" of horses in Norse mythology as being able to "mediate between earth and sky, between Ásgarðr, Miðgarðr and Útgarðr and between the world of mortal men and the underworld." In the 19th century, Jacob Grimm proposed a cognate in the personified rumor in Roman mythology; Fama. However, Grimm notes that unlike Fama, Gná is not described as winged but rather that Hófvarpnir, like the winged-horse Pegasus, may have been. ^ a b Byock (2005:43). ^ a b c Byock (2005:44). Wikimedia Commons has media related to Gná. This page was last edited on 5 November 2018, at 12:20 (UTC).